"Basilius German was born on June 14, 1826, in Baden, Germany, the son of Mr. and Mrs. Frank Germann. He received his education in his native land, and learned the trade of cloth weaving. In 1847, he came to America to seek his future. The story goes that he was intending to marry in Germany, but that his girl friend and he got into an argument. For spite, she got on the next ship to America. He followed her on the next ship, and they met in the strange land where neither of them could speak English and neither had any friends. Overjoyed at seeing someone whom each knew, they made up and got married! ...(Notes from Chris: Basilius and Gertrude and their families are both found in Onsbach, Baden Catholic records, however, there is no record of their marriage. They are said to have emmigrated in 1847, however, this is off by a year, and I have found the ship carrying Basilius and his family, and they arrived in New York on May 30, 1848, on the ship "Eliza Dennison". Basilius is listed first, then his father Franz, then siblings Frederika, Carl, and Christina. Then his sister's family is listed: Conrad and Helena Hofer, and their children Herman, Magd and Soph. I do NOT see Gertrude Seeger/Sager on the ship listing, though the handwriting is a bit difficult to decipher in spots. So at this point, I believe the above story to be true, that Gertrude came on a different ship. I am still looking for her ship. Since they arrived in 1848, not 1847, I believe their marriage year should actually by 1848 also, which is probably more in line with their first child being born in 1849. I am also still searching for their marriage record. 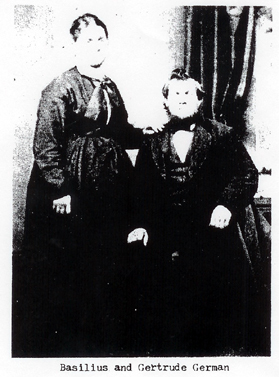 He was united in marriage to Gertrude Sager in Buffalo, NY, in 1847. She was also born in Baden, Germany, on March 17, 1828. She received her education in her native land, and came to America in 1847, arriving in Boston. Mr. and Mrs. German at first lived in Buffalo, New York, where he conducted a six loom shop for weaving cloth. Later he purchased ten acres near Niagara Falls and farmed till 1952. At that time, he wanted to join the gold rush, but his wife refused. Some friends, Streitmatter by name, talked them into going to Princeville, Illinois. Here he gradually acquired 160 acres north of Princeville. The place is still known as the Old German Farm. In those early days, there was no Catholic Church nearer than Kickapoo, and so Mr. German often would walk the 18 miles to mass. He would take with him a basket of eggs, either as a price for the night's lodging, or for the Church. Mrs. German was known as a kind and obliging lady, with a great heart and a cheerful word for everyone. Both had to work hard to carve out a home for themselves and their family. After many years on the farm, they retired to Princeville, where they celebrated their golden wedding on February 15, 1898. Mr. German passed away on June 20, 1904, at the age of 78 years and 6 days. He was laid to rest in St. Mary Cemetery, Princeville. Mrs. German lived on till July 9, 1910, having reached the age of 82 years and 3 months. Paralysis was the immediate cause of her death; her health had been good until a very short time before her death. Her funeral was one of the most largely attended funerals held in Princeville. She, too, was buried in St. Mary Cemetery, Princeville, Illinois." "Bacillius and Gertrude (Sager) German … were natives of Baden. [Basilius] was a cloth weaver by trade and in 1847 crossed the Atlantic to the new world, settling in Buffalo, New York, where he conducted a six-loom shop, devoting some time to the weaving of cloth. Later he purchased ten acres of land near Niagara Falls and carried on farming until 1852, when he left the Empire state and removed to Peoria county, Illinois, where he again engaged in farming. He first purchased sixty acres, to which he afterwards added a twenty-acre tract and still later bought eighty acres more, so that his farm comprised one hundred and sixty acres. The property is still in possession of the family. Both he and his wife passed away at Princeville, Illinois, to which place they removed when Mr. German retired from active farm life."